1. Mix together flour,yeast,salt,sugar and warm water till you get a slightly sticky dough. 2. Add oil and knead for 3-4 minutes till you get a smooth dough. Press a finger in the dough to see if the dough springs back. 3. Cover the dough with a kitchen towel and allow the yeast to work its magic for 40-45 minutes. 4. Meanwhile, make the Garlic Spread. 5. After 45 minutes, you'll find that the dough has risen to double its size. Knock down the air in the dough & divide into 2 portions. 6. Apply some flour to prevent from sticking & roll the dough using a rolling pin into a half inch thick disk. 7. Cut out the extra & make it look more like a rectangle. 8. Apply some Garlic Spread throughout the dough. Add some grated cheese onto it if you want. 9. Using you hand, roll the rectangle dough into a cylinder. Using your hands, close the ends. 10. Cut the cylinder into equal portions. Apply the garlic spread on top of the rolls too. 11. Also apply a teaspoon of milk on all the rolls. 12. Sprinkle some sesame seeds if you want. 13. Onto a greased pan, arrange all the rolls. 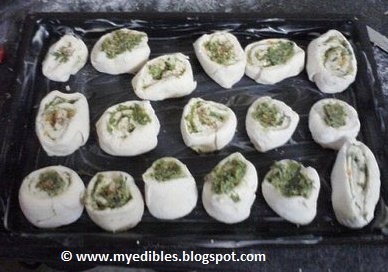 Bake them at 180 degree C for about 20-25 minutes. 14. Do check on the rolls with a toothpick to see if they are cooked. I don't have any more pictures! :'( But be sure to check out the recipe here. Beautifully explained with amazing pictures!